I continue my series on Illinois born major league players. If you wish to see the list of players we have highlighted so far, please click HERE. 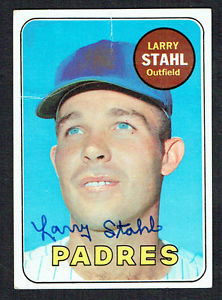 Larry Floyd Stahl as born on June 29, 1941 in Belleville, Illinois and became a professional baseball player who played outfielder in the Major Leagues from 1964-1973. He played for the Kansas City Athletics, New York Mets, San Diego Padres, and Cincinnati Reds. He made his debut on September 11, 1964 for the Athletics as a pinch hitter. He got his first hit against the Yankees on September 19th with Ralph Terry on the mound. His one moment in history may have came on September 2, 1972 as a member of the San Diego Padres. Milt Pappas was on the mound for the Cubs and he retired 26 btters in a row and now faced Stahl as a pinch hitter. Pappas got the count to 2-2 with Bruce froemming behnd the plate and threw a very close pitch for ball 3 on the batter. The next pitch was too close to take but Froemming called it ball four and the perfect games was gone and broken up by Larry Stahl. Pappas preserved the no-hitter on the next batter. Primarily an outfielder, his best year was 1971 at age 30 when, in 114 games for the Padres, he hit .253 with eight home runs and 36 runs batted in. He had exactly 400 career hits. In his one postseason appearance, the 1973 National League Championship Series, playing for the Reds he had two hits in four at bats. William Joseph Webb was born on June 25, 1895 in Chicago, Illinois. He played in five major league games with his debut on September 17, 1917 as a second baseman for the Pittsburgh Pirates. He went ent hitless in his first four games but on October 1, 1917, which turned out to be his last major league game, he got three singles in four at bats to end his career at 3-for-15 for a .200 batting average. He went to the minor leagues and became a player-manager for the Buffalo Bisons in 1924-1925 and then moved up the ldder from there. He was a third base coach in the major legues for fives seasons and then went to the front office for the White Sox as minor league director. He died in a car accident on his way to work on January 12, 1943. Joseph Edmund Zdeb was born on June 27, 1953 in Compton, Illinois (Compton is a village in Lee County, Illinois, United States. The population was 303 at the 2010 census, down from 347 in 2000) and attended high school at Maine South in Park Ridge, Illinois. He had a scholarship to the University of Missouri to play football but was chosen in the 4th round of the 1971 amateur draft by the Kansas City Royals. He decided to play baseball. He had several minor leagues stops on his way to the major leagues. At some point, during minor league spring training, he showed up to camp with long hair, which was against team policy. Manager Joe Gordon refused to give him a uniform, so he approached general manager Lou Gorman, asking “Mr. Gorman, if I cut my hair, will I become a better ballplayer?” Gorman said he needed to cut it to properly represent the organization, and after initially refusing, he did so a couple days later. He made his major league debut on April 7, 1977 and went 1-for 4. He was a platoon (left fielder) player most of his brief career. He played his last game in May 29, 1979. On January 15, 1980, Zdeb was traded to the Chicago White Sox for pitcher Eddie Bane. He finished his professional career that year, splitting the season between the White Sox Iowa Oaks affiliate and the Tidewater Tides in the New York Mets organization. His struggles at the plate continued, as he hit a combined .194, and after the season he was out of professional baseball. For his career, he batted .272 with 2 home runs and 34 runs batted in. 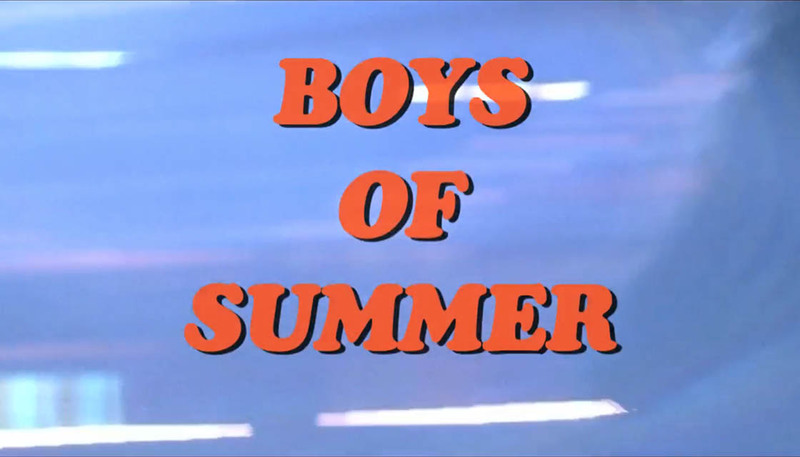 Welcome to my series called, Illinois Born “Boys of Summer”. It is my hope to bring some history to your baseball knowledge from the State of Illinois. Many cemeteries around the state have the grave sites of former major league players. From the big towns like Chicago and Peoria to the smaller one in Atlanta, Staunton, Latham Havana, Emden and more, we find former major league players. 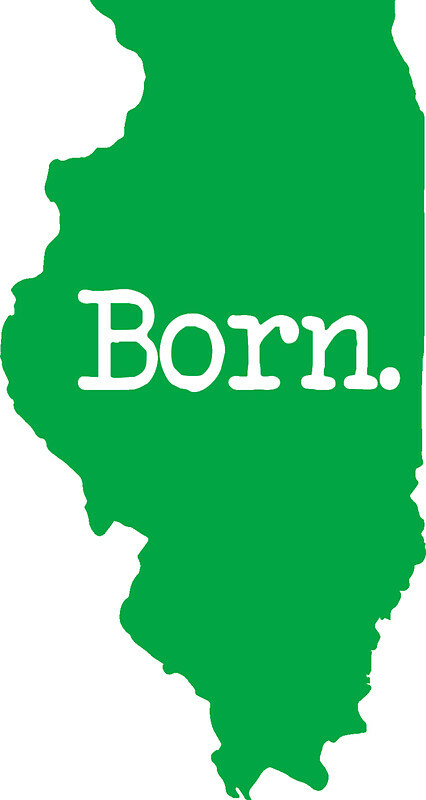 Here is a link to each one that has been written and the town they were born in Illinois. Enjoy! Here is my on-going series on Illinois Born major league baseball players. Born Kenneth Peter Jungels (June 23, 1916 – September 9, 1975) in Aurora, Illinois. He became a Major League Baseball pitcher who played for five seasons. He played for the Cleveland Indians from 1937 to 1938 and 1940 to 1941 and the Pittsburgh Pirates in 1942. He made his debut with the Cleveland Indians and went 0-for-4 on September 15, 1937.. He last played on June 7, 1942 in a Pirates uniform. His career record was 1-0 with a 6.80 ERA and struck out 21 batters. His nickname was “Curly”. 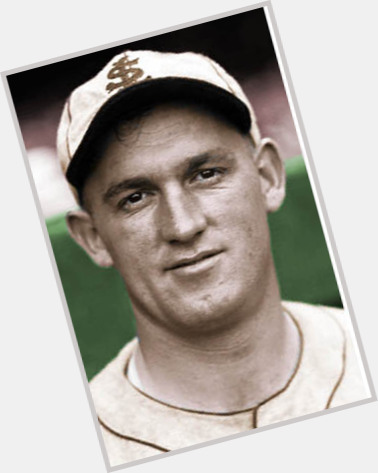 Henry John Keupper (July 24, 1887 in Staunton, Illinois – August 14, 1960 in Marion, Illinois), was a professional baseball player who played pitcher in the Major Leagues in 1914. He would play for the St. Louis Terriers. He was 8-20 in his career which was just one season with a 4.27 ERA. George Stephen Vukovich (June 24, 1956) is a former right fielder in Major League Baseball who played for the Philadelphia Phillies and Cleveland Indians in all or part of six seasons from 1980–1985. Listed at 6′ 0″ , 198 lb. ), Vukovich batted left handed and threw right handed. He was born in Chicago. Vukovich attended college at Southern Illinois University, where he was a member of Phi Sigma Kappa fraternity. The Phillies selected him in the fourth round of the 1977 MLB draft out of SIU. Vukovich made his major league debut with the Phillies in 1980, appearing as a pinch hitter in a game against the Montreal Expos. He received a World Series ring in his rookie season, even though he did not play in the Series. In December 1982, Vukovich was sent along with Jay Baller, Julio Franco, Manny Trillo and Jerry Willard to the Indians in the same transaction that brought Von Hayes to Philadelphia. Afterwards, he played two seasons in Japan for the Seibu Lions from 1986 to 1987. In between, Vukovich played winter ball with the Águilas del Zulia of the Venezuelan League during three seasons spanning 1979–1982. He was born Thomas Frank Haller in Lockport, Illinois on June 23, 1937 to Frank and Julia Haller. He played 12 seasons in the msjor leagues as a catcher for three different teams in his career and was selected as an All Star 3 times. He made his debut on April 11, 1961 for the San Francisco Giants and his last game was for the Detroit Tigers on October 4, 1972. He hit .257 in his career and smacked 134 home runs and had 504 runs batted in. The story goes that his dad, who worked in the steel mills in Joliet, Illinois, headed to Barrett;s Hardware Store with a list in his hand from his wife but didn’t buy anything as he spent $68 on baseball equipment for his kids. This amount of money would take a year for him to pay back. His wife, Julia, was upset because they didn’t have 35 cents to buy bread. Fast forward to high school and he was a three sport star in football, baseball and basketball at Rockport High School and earned a football scholarship at the University of Illinois where he became the starting quarterback. During his junior year at Illinois, in 1957 he was third among the Big Ten Conference quarterbacks in passing. Against Ohio State, in the Big Ten opener, he went 10-for-13 with 183 yards passing, but the Illini lost to Ohio State, 21-7. The following week, he led his team to a 34-13 upset over Minnesota. Later in the season, in a nationally televised game, they toppled Michigan 20-19. They ended the season rolling over Northwestern 27-0. During the summers he would play baseball and Haller headed to Moose Jaw Canada and contributed 18 home runs and caught the eye of baseball scouts. He was signed by the San Francisco Giants on February 25, 1958, for $54,000. Part of that money, $2,500, was sent directly to the University of Illinois. Haller, the star quarterback, had left school with one year of eligibility remaining. His feeling was that, “It was only fair to repay the money since I cannot continue to compete for the university.” His father also stipulated that he would return to school and get his degree, and that he did. He spent the next three off-seasons at Illinois, completing his degree in Physical Education, graduating in 1961. 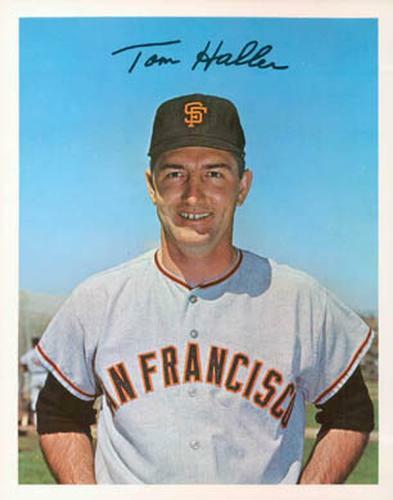 Haller hit .261 with 18 home runs and 55 RBIs for the Giants in 1962, in a platoon system alongside Ed Bailey. Haller and Bailey combined to give the Giants 35 home runs and 100 runs batted in from the catcher’s position as they battled the Los Angeles Dodgers in a tight pennant race.The two teams ended the season tied for first place and met in the 1962 National League tie-breaker series. The Giants won the three-game series to clinch the National League championship. The Giants then lost the New York Yankees in the 1962 World Series in seven games. He collected four hits in 14 at-bats with a home run and three runs batted in during the Series.He was traded to the Dodgers in 1968 and played four seasons before being shipped to Detroit for his final year in 1972. After his playing career ended, Haller worked for the Giants as a coach (1977–1979), and was their vice president of baseball operations (1981–1986). He was named to the Giants’ 25th anniversary team in 1982.In 1986, he served as the manager of the minor league Birmingham Barons. In June 1986, He was named as the General Manager of the Chicago White Sox. After a long illness with the West Nile Virus , Tom Haller died in Los Angeles, on November 26, 2004 at age of 67. His brother Bill Haller was a longtime umpire. Continuing with major league players that were born in Illinois. Please take time to look back and some of the other profiles written. Born Irving John Medlinger on June 18, 1927 in Chicago, Illnois. He was a left-handed pitcher that made his debut on April 20, 1949 for the St. Louis Browns. In that debut (BOXSCORE) he came in to pitch the 8th inning against the Cleveland Indians and got them in order without any issues. The 9th inning was a different story as he issued a walk, fanned the next batter, allowed a double, fanned the next one and allowed a single before they removed him from the game. His stat line is 1.2IP/3H/3ER/1BB/2K. For his career he had a 13.83 ERA with 9 strikeouts in 13.2 innings on the mound. He played his final game on September 28, 1951. He died at age 48 in a small plane crash as the engine failed on a Piper PA-24 Comanche near Wheeling, Illinois on September 3, 1975. Newton Shurz Halliday was born on June 18, 1896 in Chicago, Illinois. “Newt” has very little record of his baseball activities, however, we know he made his debut on August 19, 1916 with the Pittsburgh Pirates and it was the ONLY game he played in. HE took one at bat and struck out and he had three putouts as a first baseman. Records show he didn’t play in the minor leagues. 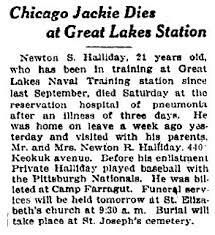 He joined the Navy after the start of World War I and was stationed at Great Lakes Naval Training School and it was there he came down with tuberculosis and died at Great Lakes, Illinois on April 6, 1918 at the age of 21. Halliday was one of eight Major League Baseball players known either to have been killed or died from illness while serving in the armed forces during World War I. 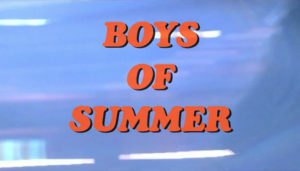 The others were Alex Burr‚ Harry Chapman, Larry Chappell‚ Harry Glenn, Eddie Grant‚ Ralph Sharman and Bun Troy.